In this month's newsletter we review some changes associated with the latest 32/64-bit compatible version of CDXZipStream. These include Bing-compatible templates, the ability to calculate transit options, and troubleshooting instructions. We also review when to use custom function formulas versus text values when returning CDXZipStream data. Each template includes a drop-down menu where you can select either MapPoint or Bing as the source of mapping data. Since Bing Maps is a web-based service, internet access is required to use this option. There is also a minor difference in functionality. When using Bing Maps with the Driving Matrix and Driving Calculations Templates, available calculations are driving distance and time, while MapPoint can also calculate trip cost and total trip duration. Free templates can be downloaded from our links page. The Bulk Radius Analysis Template can be purchased from your account area if you are currently using the CDXZipStream Bing version or higher. The CDXRouteBing function of CDXZipStream can calculate distance and time, get directions, and create maps for transit routes (as well as driving and walking routes). When used to calculate transit options across many destinations, CDXRouteBing is a valuable tool for public transportation analysis and planning. Microsoft started including transit data in Bing Maps in 2010, and coverage is now extensive, particularly in North America, western Europe, China, and Australia. More than 3000 transit agencies across 30 countries are covered in total. In North America, this includes 375 cities in the US and 59 in Canada. 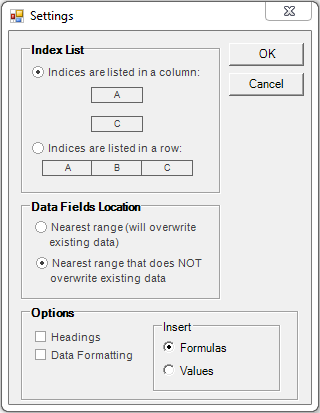 We also recommend enabling "Autocopy" and "Set to Text" options when working with long lists of data, so the requested data is automatically obtained for the entire list, until the first occurrence of an empty row. Returning the data as text in lieu of formulas will also prevent delays for formula recalculation when sorting the results. Specific address locations do not need to be used for the start and end points of the route. You can also use ZIP Codes, or if GPS data is available, points of latitude and longitude. The route calculations and any associated maps and directions will include parts of the route that require walking between transit options. 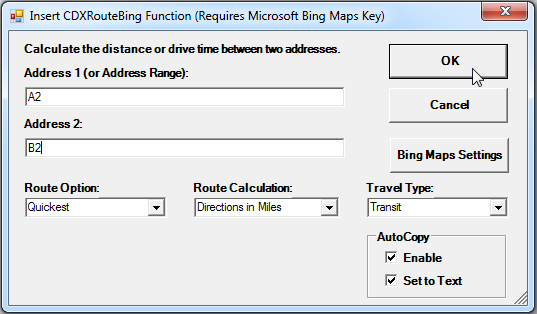 You can also use the options in the "Bing Maps Settings" interface to specify that the directions be returned as a single string or array, and to select the map style. - CDXZipStream Custom Functions Return #NAME? 1. Use the Task Manager to close all instances of Excel. 2. Restart Excel and go to the the File - Options - Add-ins dialog to check if the CDX_ZIPStream and CDX_ZipStream.UDF add-ins are enabled. 3. If one or both are disabled or inactive, re-enable using the "Manage" function at the bottom of the dialog. If the above approach doesn't work, uninstall CDXZipStream from the Windows Control Panel, then reinstall using CDXZipStream.exe. For more information, and for troubleshooting the classic version, please refer to the articles above. When using CDXRouteBing or CDXLocate Bing, data is returned as formulas unless the "Set to Text" option is selected. So when should you use formulas versus text values? Formulas have the important advantage of allowing you to update your data quite easily when your worksheet changes (e.g. your customer address list is updated), or when a CDXZipStream database has been updated. For worksheet changes, Excel will typically detect the change and automatically recalculate formulas. (You can also control when this happens in the Excel "Formula" tab, using the options in the "Calculation" group.) When there is a change in an external database, Excel will not automatically recalculate, but you can force recalculation by using CRTL-ALT-F9. Another advantage with formulas is you can copy-and-paste to apply them to new data in your worksheet without using the CDXZipStream interface. But there are situations where we recommend the use of text values. When working with very large data sets, for example, formulas can slow down Excel, especially if automatic recalculation occurs during filtering, row insertion, or other common worksheet tasks. If this is a concern, you can turn off automatic worksheet recalculation, request your data from CDXZipStream as text values, or you can easily convert formulas to text by copying and pasting them as values in the same area. You must also convert formulas to text values if you send your worksheet to someone who does not CDXZipStream installed on their computer. Canadian and U.S. data feeds were updated as of February 23. There were 9 changes made to the U.S. database this month. If you would like to update your database to reflect these changes, select the "Account" option on the CDXZipStream commandbar and click on "Check for Available Database Updates". You can then update each database as required. Updates are a part of the one-year software maintenance subscription included with your purchase of CDXZipStream. If you would like to extend your subscription, please sign in to the CDX Technologies website and from the account area, select "Buy Data Update". As always we hope you find the information here helpful for you and your organization. You can contact us with your feedback and suggestions by replying to this email. CDXZipStream Custom Functions Return #NAME?